A Cashback is a partial refund of a payment made via Satispay. If and when there is an active promotion, the user’s Balance is credited with the Cashback immediately after the payment is sent. 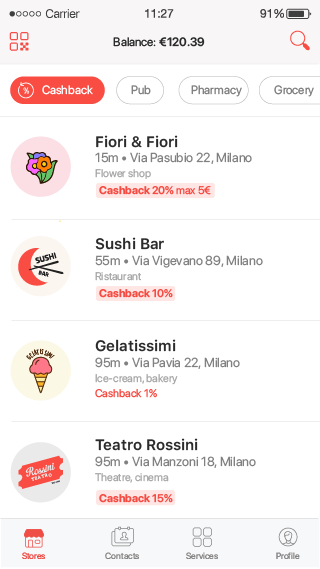 The percentage amount and any limits on the Cashback are displayed in the app and are updated after each payment, so you can check the app at any moment! To illustrate with an example: your dinner bill comes to 50€ and luckily for you, the restaurant is offering a 10% Cashback with a max of 5€. You send the store 50€, which is subtracted from your app’s balance. Then, having completed the payment, the 5€ Cashback is automatically added to your balance and can be used immediately, whether it be for your next purchase or simply paying a friend. Here is what stores offering a Cashback look like within the app. Is the Cashback a discount? Not exactly. Although the final result is similar to a discount, Cashbacks differ in that the promotion is applied after the payment has been made. It is therefore necessary that you have enough money in your balance to pay the full undiscounted amount.